This tastefully renovated two bedroom maisonette is ideally situated on a gated complex in a prime location of Kato Paphos. It is within easy walking distance to the beach and amenities and a short stroll away is the picturesque Harbour and popular Kings Avenue Mall. The ground floor accommodation features a spacious open plan living room including comfortable lounge, dining area and fully fitted kitchen with breakfast bar. At the base of the stairs is a modern guest cloakroom with fitted vanity unit. Sliding patio doors in the lounge provide easy access to a veranda and private driveway beyond. A neat and easy to maintain courtyard garden is accessed directly from the kitchen and here there is plenty of space for barbecues, al-fresco dining and relaxing. On the first floor are two large double bedrooms with fitted wardrobes and a stylish modern bathroom. The master bedroom has a private balcony with space for table and chairs and has pleasant views of the surrounding area. 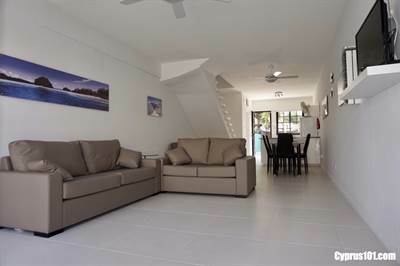 The property is suitable as a permanent and/or holiday home/rental investment. All the amenities and local transport are close by and it’s not necessary to have a car when staying in this area. The communal swimming pool is discreetly situated in one corner of the complex and is for the use of residents only.